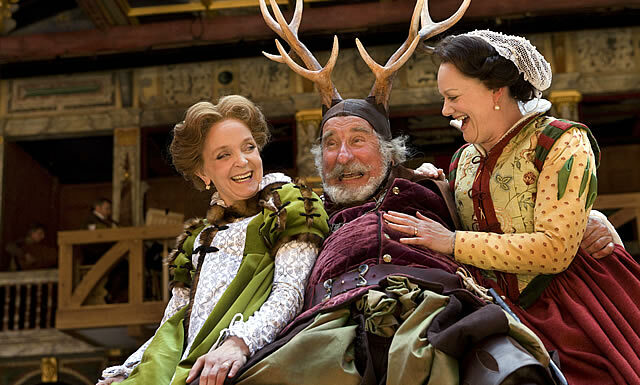 Heaven give us many merry days.The Merry Wives of Windsor. Midnight. Globe Theatre. London. September 17 2010. For no other reason than we see Christopher Benjamin resplendent in green and purple silks, leaping into a giant laundry basket do I love this production. For regular followers of these epistles you may have noted that this sounds a little like Christopher Luscombe’s splendid production of Merry Wives from 2 years ago. Well you would be right. The same production was back after rave reviews, and in the mood of merriness, mirth and unrestrained whimsy I decided to flash along and see it again –this time in keeping with the feeling of Falstaff’s “Be you in thePark about midnight, at Herne's oak, and you shallsee wonders” my friends and I scuttled to the midnight performance. There is something a little special about midnight matinees. Clearly it is an unwritten rule that on such occasions a very select company of likeminded lovelies must accompany one, and following the spirit of this invisible edict a group of us gathered outside the Globe, huddled with a selection of cakes and liquid refreshment. The rest of the audience seemed to understand this too, and the midnight crowds are invariably made up of groups of friends revelling and wassailing. 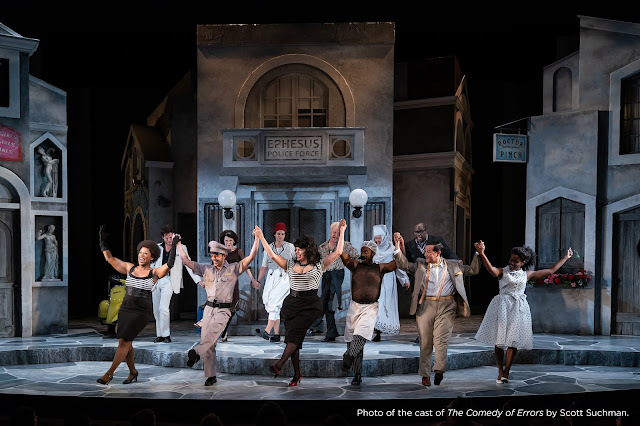 The production itself seemed to reflect something of the ambience; conveying a keen joyousness, an unrelenting merriment, a dazzle of festivity. 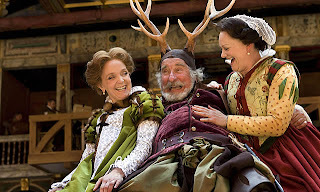 From the opening strains of the ‘merrily’ themed canticle to the closing jig marked out by a youthful exuberance which belied Falstaff’s age, the whole production was a mass of farcical shenanigans, roistering romps and sparkling joie de vivre. We of the penny stinkards cheered, booed, halloed, whooped and guffawed our way through the whole event. It is always something of a treat to attend the theatre with neophytes in the world of Shakespeare as it constantly reminds one of the excitement to be found in the theatre. So many of us are bored by Shakespeare at school just because we never get the chance to experience his works where they belong. Anyway, mild rant at shockingly two-dimensional methods of education aside, and back to the production in hand. Whilst nothing had changed drastically from the run 2 years ago, except for some casting changes, it was good to revisit some of the high points. Ford’s exclamatory remarks on the ‘buck-basket’ were once again a treat (Ford played with gusto by Andrew Havill) and I still rather adored Master Slender (William Belchambers)-despite his obvious penchant for ladies’ clothes. I found perhaps this time the final dénouement, with Ford’s love for his faithful wife reaffirmed, perhaps rather more moving than before. The charm and warmth of the show seemed to reach its pinnacle with this. My friends and I sighed and declaimed ‘ahhh’ in unison. So as the final moments closed, a group of merry revellers left the Globe under the early morning sky, filled with joy and singing merrily, merrily, merrily ; just as we should have.